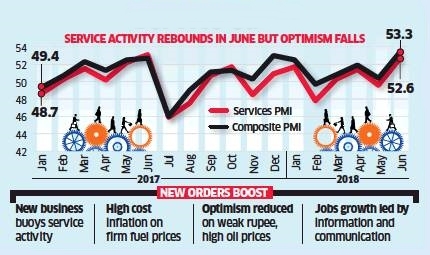 Buoyed by a surge in new business orders, India's services industry expanded at its quickest pace in a year in June. 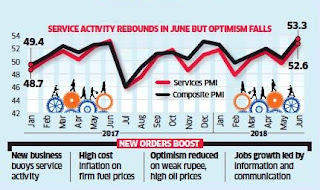 Data released earlier had showed an equally strong performance by the manufacturing sector, suggesting a broad-based recovery in the economy. Retail inflation in May rose to a four-month high of 4.87%, justifying further monetary tightening. The Reserve Bank of India increased key lending rate last month after four years, as crude oil prices surged and the bank raised its inflation projection. It now expects inflation at 4.8-4.9% in the first half of the financial year and 4.7% in the second, compared with earlier estimates of 4.7-5.1% and 4.4%, respectively.